What areas can be treated with SculpSure™? SculpSure™ is FDA cleared to remove fat deposits in the abdomen, love handles, flanks, bra rolls, back and thighs. Treatment results vary based on each patient. Some patients may need only one treatment, while others need multiple treatments. Schedule a Free consultation to receive a customized treatment plan. Some patients report seeing results as early as 6 weeks after treatment. Over time the body will eliminate the destroyed fat cells and results will become more visible, with optimal results seen at 12 weeks. How long does a SculpSure™ treatment take? 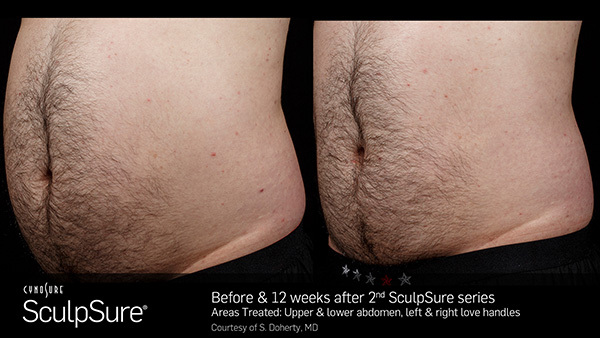 One SculpSure™ treatment lasts only 25 minutes and can easily be done during the lunch hour. There is no downtime, so you can resume your daily activities immediately. SculpSure™ is ideal for patients who follow a healthy diet and exercise regularly, but still have suborn pockets of fat that do not respond to diet and exercise. 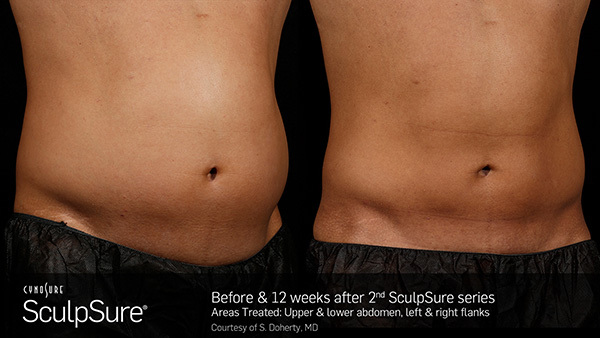 SculpSure™ is specifically designed to permanently melt the stubborn fat cells away. Most patients feel a warm tightness with a slight tingle intermittently throughout the treatment. The energy level of the laser can be adjusted so that treatment is tolerable.